The JS9500 series of 4K SUHD Curved TVs is perched at the pinnacle of Samsung's 2015 lineup and deservedly so. The display's picture quality is stunning and the list of features is stupefying. No wonder Samsung bestows an "S"UHD label on their high-end JS series models. For the videophiles, the JS Series TVs employ nano-crystal (other manufacturers call it Quantum Dots) technology, which produces a wider spectrum of colors that rival the color range of OLED TVs. For the futurists, the JS9500 is also capable of exhibiting HDR (high dynamic range) content. I'll discuss more about HDR below. For now, let's say, (when compared to standard HDTVs) the prevailing sentiment is that 4K resolution is a cool but subtle difference. The nano-crystal color range is more pronounced. But HDR capable displays clearly outshine the competition in rendering brighter whites. For the pragmatists, the cost of a TV offering the total package of 4K, nano-crystals, and HDR is still significantly more expensive, especially when you consider that the amount of 4K native content is just beginning to move the needle and HDR mastered programs are more a promise on the horizon than a reality now. (Editor's Note: Samsung makes three sizes of the JS9500 series of Curved SUHD TVs, this 65-inch and its 78 and 88-inch bigger brothers. Since the three models possess similar specifications, this review can apply to all of them. The video performance of the Samsung 65JS9500 is superb with native 4K content as well as upscaled standard HD programs. Samsung provided samples of HDR scenes from Life of Pi and the HDR "future's so bright, I gotta wear shades." The integrated audio - even with the added pair of built-in 10W woofers - is O.K. but not up to the quality of the video. Samsung loves to supply an overflowing bevy of features in their top tier TVs and the JS9500 does not disappoint with Wi-Fi, apps galore, voice recognition, 3D, Bluetooth, screen mirroring, smart view, MHL and ARC support, even an integrated video camera for Skyping and controlling the TV by hand motions. All these features tends to make the 65JS9500 harder to learn if not more difficult to use. Luckily, the initial setup is simple and you can be enjoying a great looking picture quickly. Now, if you wish to explore all of the extras like motion and voice control, expect to set aside study time. 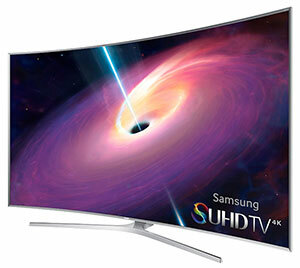 On the Samsung website, their 65-inch JS9500 4K TV lists at a suggested retail price of $8000. Granted, this TV has a sublime display and is chockfull of features, but at that premium, the "S" in SUHD could stand for sticker shock. Even though the 4K Ultra HD TV marketplace is in its infancy, the competition is fierce, which is probably the reason that Samsung's 4th of July sale (which has been extended to the 18th of July) offers this 65-inch model for $5000 plus a soundbar. If you are reading this after the sale, you might consider waiting for the next opportunity. In considering the 65JS9500 for my DIY HT, replacing a 50" Panasonic plasma, I can not find information on whether or not the 'One Connect Box' can be remotely located from the display. My current set up - which can not be changed - all A/V, remote control, computer, and Ethernet components are located in a closet approx 40' from the display. I use a single high quality-lo loss HDMI cable between A/V Receiver and the display. The $64,000 question - how far can the Connect One Box be located from 65JS9500 display without compromising any features? THANK YOU HDTV SOLUTIONS - Great site, tons of information and in depth reviews.